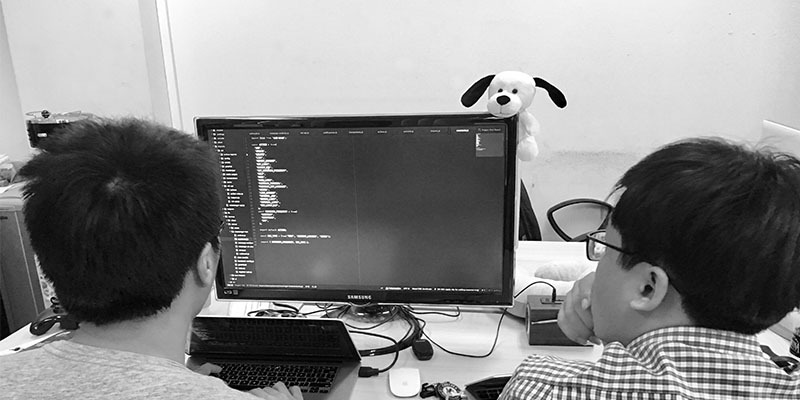 Lately, our Designveloper team started implementing a new working method – Pair Programming, where is two programmers sitting side by side at one computer, sharing just a single workspace. We were very nervous at the first time. You know, we, programmers got used to using our own swords and fighting solo when getting into the war. Then, suddenly you have to share your weapons with another guy, how confusing it could be? Surprisingly, we have to admit that much like a cup of coffee a day, pairing tastes awful at first, but we end up liking it after just a few weeks imbibing of it repeatedly. 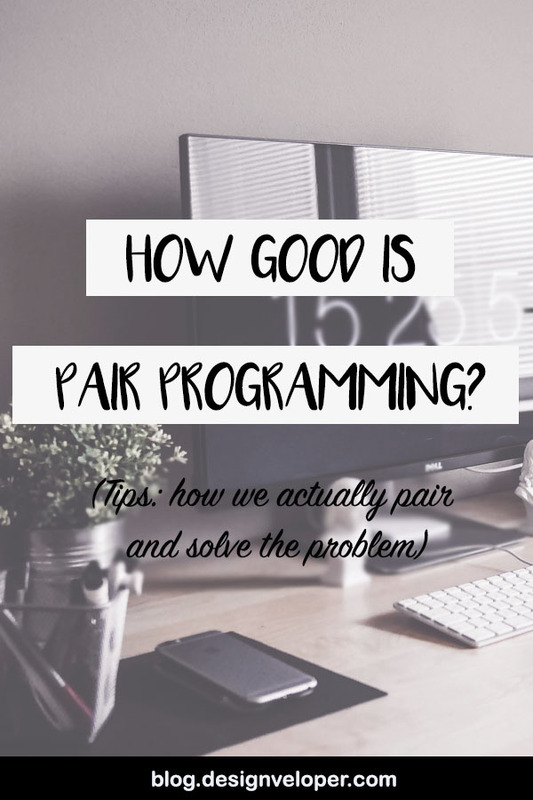 So in today’s post, I’m going to share with you some reasons why we fell in love with pair programming and why it’s a good idea for every ninja coder to give it a try. WHAT EXACTLY IS PAIR PROGRAMMING? In a nutshell, pair programming is when two programmers are coding together. To make it easier to understand, let’s imagine when you and your friend are in the car. You’re driving and your friend is responsible for looking at the map and show the direction. The same can be said of pairing. In pair programming, while one developer is writing code and implementing solution, the other beside will keep an eye on the big picture and navigate. At Designveloper, we do pair programming slightly different. Typically, in pair programming, it is recommended to use only one machine for both developers but we use two machines. The reason is that each developer has his/her own preferences, for example: text editor, IDE, font, color, screen resolution, place where his/her code resides, etc. Letting each developer works on his/her own machine would make the developer feel more comfortable. The other developer can also learn more from these preferences and he/she can pick what he/she wants. However, the common mistake when 2 developers working on 2 machines is that the navigator tends to use his/her own machine while the other is coding. To avoid this problem, we explicitly require the navigator to close his/her own laptop. 2 laptops works best with a big monitor. It is recommended to have at least 23” monitor with 2 HDMI ports. Skype or Hangout screen sharing work best in case of working remotely. If 2 developers sitting next to each other but do not have an extra monitor, using built-in screen sharing feature of mac to keep 2 machines displaying the same is recommended. Throughout the process, programmers will switch role frequently, constantly talk to each other, especially do research together to keep both engaged. We also have pair programming diary. At the end of everyday, the lessons learnt will be documented. In the end of a working week, all the lessons could be used for sharing via a blog post for example. Last but not least, we highly recommend you to use the Pomodoros technique for keeping time and taking break between every section. You can use Be Focused app on app store to execute this. It would never be easy to measure the value. That’s why we use Hubstaff to track all the work and get invaluable insights about the real result programmers produce. Since both members of the team are experienced, they can produce the best quality for sure. The thing is there’s always something more to learn but experts used not to make questions. And as a result, they normally lose their creativity and less likely to introduce new solution. This will be a great opportunity for the novice learn more from the expert. When the novice raises questions, the expert have to think over and explain. This Questions & Answers process can lead to the best new solution. Nonetheless, make sure the novice is active. If not, the novice may end up just watching and the expert will feel annoyed. This is the watch-the-master phenomenon. Obviously, two novices pairing can give better result than they working independently. But this combination is discouraged. As usual, after the code is written, we need to review it to improve the quality. The things is even though you try your best to focus on reading your code again and again, you still might not come up with some suggestions for a better quality. 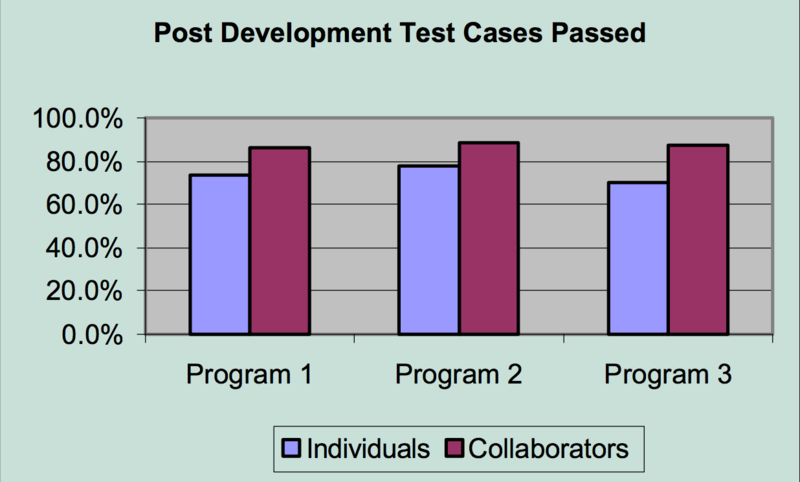 But with pair programming, the review process will be done WHILE the code is being written. It sure make the code nicer, reduce the risk of errors and failures. Moreover, two heads are always better than one. A solo developers can’t think up more alternatives when proceeding than a pair could. And as the result, it leads to better design quality. Let’s face the fact that humans fundamentally like being social. And pairing means more communication. It gives chances to make friends with the ones we normally don’t hang out with. In consequences, it builds trust inside the team and makes employees comfortable. Happy employees help us to build a productive and effective team for sure. Everyone makes mistakes. Sometimes, to solve the problem you just need a simple solution but somehow you can’t realize it by yourself. In pair programming process, we will constantly and easily learn from our partners. When an expert and a novice are paired, we can save ourselves a lot of headache and time in training newbies. 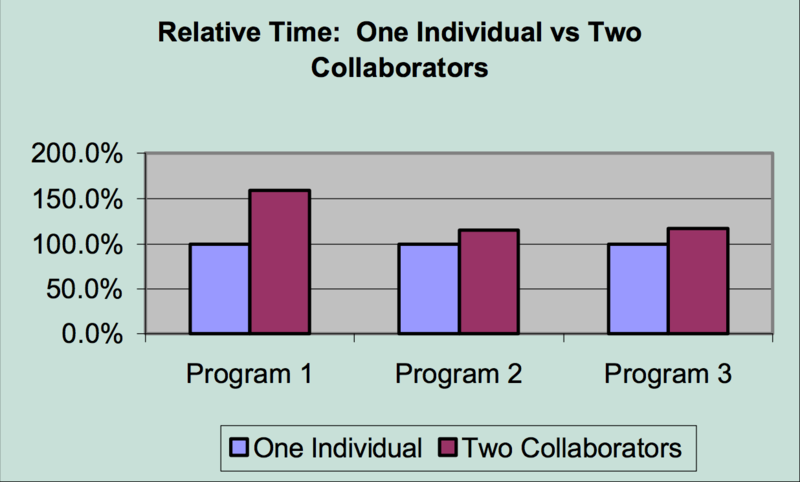 Pair programming could be a good way to strengthen each other skills faster. If you think that having two programmers work on a task will double the hour it takes to do that task, you’re wrong! I did think the same at the beginning. Having a second set of eyes can help us debug faster. Time saving is obviously equal to more money! Don’t you ever feel frustrated when your staff is off and then tons of workflow are interrupted? When it comes to pair programming, you can say goodbye to this stress. One member in pair is off, the other still knows exactly what to do without taking time to transfer. – Taking up all the time talking: If one person in pair or both do not have any experience about the task they are working, they might end up explaining things almost time and might not even touch the keyboard to write code. – Bad effect on each other: What I mean is that if a member is with his/her head in the clouds, or is simply a slow typer, it can slow down his/her partner as well. – Lacking self confidence: The most common situation we met is someone in pair doesn’t have courage to admit that he/she is stuck at some points. They just wait and hope things get clearer instead of asking for an explanation. This can easily lead to the “Watch the Master” phenomenon and be the main reason of disengagement. 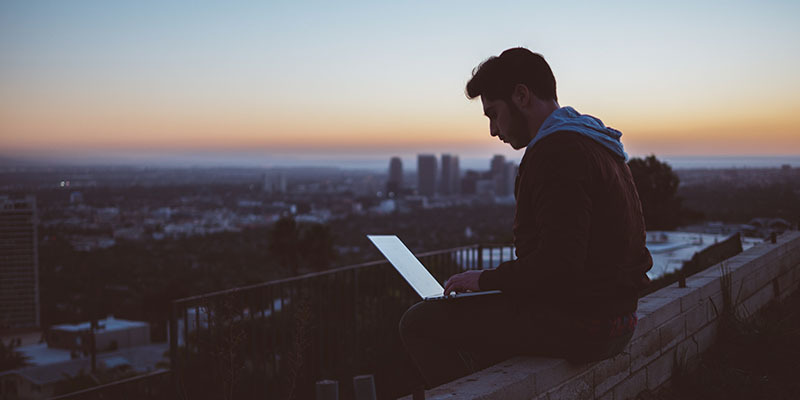 – Better when working alone: Some people are just better when working solo. They prefer being independent and self-reliant. – Strong communication skills: Pair programming is also known as “programming out loud”. Therefore, team member need to be active in speaking and even in writing documentation. – Sense of humor: Science proves funny people are more intelligent. Additionally, it will make the working atmosphere comfortable and sure release stress. – Fast typing skill: As I said before, a slow typer will slow down other teammate. After all, we are just new kids who make a real concerted effort to get our feet wet with new working method for saving time in our day-to-day workflow and bringing to our customers the best product. Pair programming can be tough and totally be a nightmare for those who can not find the right combination. But at least we did try and we have nothing to lose but a chance to win. For now pair programming still gives us a lot of fun, knowledge sharing and motivation. How about your opinion? 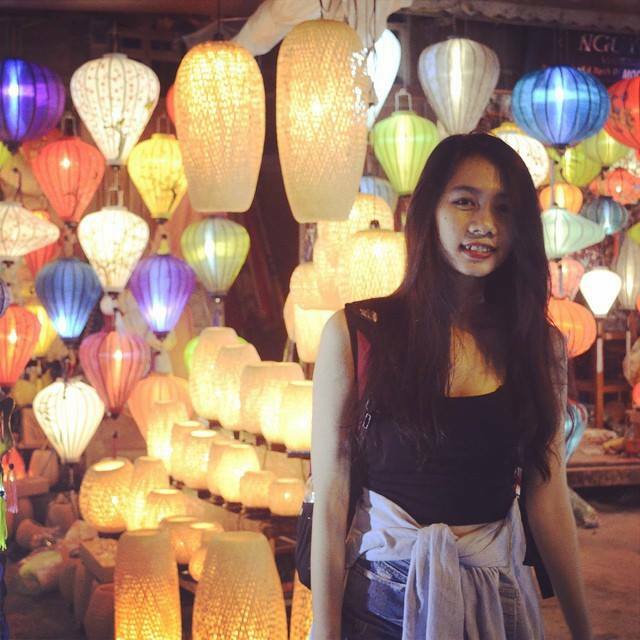 Why don’t you give it a try and share with me your experience in the comment box below? If you have any further question about pair programming, just ask, I’m eager to help you!